Here are two garments dyed via the sprinkle technique. (Click on the pictures to see larger, more detailed versions!) 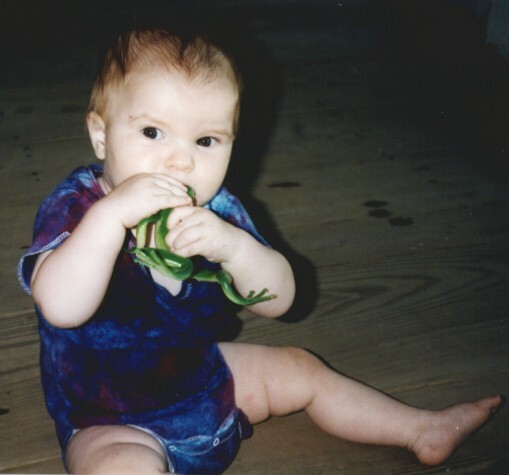 The snap-crotch baby shirt, shown at left on Peter at age nine months (yes, he appears to be attempting to eat a large rubber frog), was dyed in 1997; the romper on the right, shown in detail, was a purposeful copy of the shirt, since we liked the effect so much. The colors are so dark and intense. I also created a matching shirt, hat, and socks for a friend's child in 1997; I have no picture of them, but I used all of the dye colors, including some mixtures I made. I did the shirt in diagonal stripes, in rainbow order. It came out quite well. CAUTION! Dry dyes are dangerous to inhale, and spread through the air easily. Dyes that have been dissolved in water are much safer. When working with powdered dyes, always wear a properly fitting dust mask or respirator. ('Properly fitting' means that you do not breathe unfiltered air in around the edges of the mask.) Don't breath dye powder! Doing so could cause you to become allergic to the dyes, ending your dyeing days forever! Do not do this project indoors, as little dots of dye will fly all over the room. Do it outdoors only. This one is easy to do. You get to skip making the dyes dissolve, a step which always takes me an hour or two since I can never seem to resist making big batches. 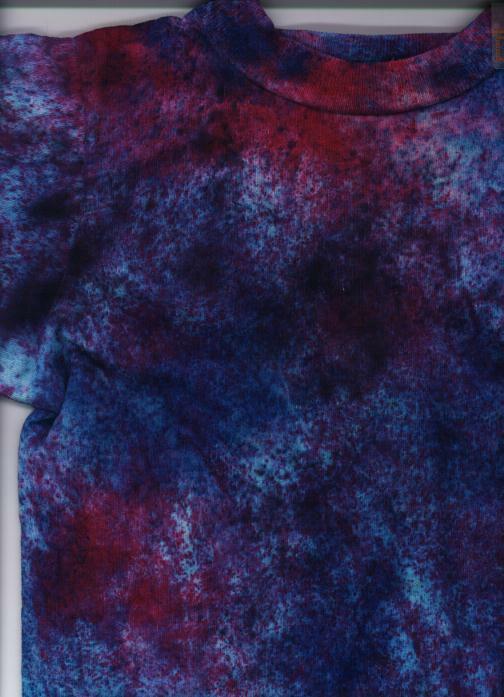 This technique, in which dry Procion MX dye powder is sprinkled on soda-soaked fabric, results in very intense colors and an interesting pointilistic effect. The effect is best on 100% cotton; however, the intensity of the effect helps to make up for the lowered intensity of dyeing fabric with 50% or even lower percentages of cotton, so I've used it on occasions when I've had such a garment that needed to be colored. I purchased plastic salt shakers with snap-on lids at a grocery store, and in each one mixed dry Procion MX dye powder with plain, non-iodized salt. The snap-on lids prevent the dye and salt from absorbing moisture from the humid air here, which would cause the dye to lose its strength. I pre-soaked the fabric in washing soda solution, just as in the main recipe, wrung it out, lay it flat, and sprinkled the dyes on. The effect is of many tiny dots of very intense color...very satisfying, assuming you take care in selecting adjoining colors. A problem arose in that not every dye has particles of the same size. Dye mixtures changed in color composition after I'd used part of the shaker's contents. This technique is best for when you do not feel the need for absolute control over your project.